Broadband is necessary but not sufficient. Like a treadmill in the basement, broadband is only helpful when you use it. Community members need training and encouragement. Community institutions like schools and health care providers need to clear away other barriers to help them achieve higher uses of technology. Sufficient broadband is invisible. Communities that have broadband quickly take it for granted and assume that sufficient broadband is in place – just like electricity. Economic developers and community leaders are able to devote their time and attention to implementing innovative, tech-based economic development strategies, rather than on improving broadband access. This gives them a distinct advantage over unserved counties where local teams spend countless hours pursuing broadband deployment and struggling with limited bandwidth and unhappy residents and businesses. Innovative communities build a buzz. It doesn’t take a Gig to get 63,000 Facebook fans (as one butcher in Bemidji has done) but it takes a culture of use, which means access, training and encouragement to use technology. These five communities provide a model for economic development and community vitality in rural Minnesota. By using advanced broadband networks as a foundation, they are attracting talented people and significant investments to their regions. While past community leadership helped to create these advanced networks, continued leadership will be essential to making full use of Internet-based technologies into the future. These communities are well-positioned to do so. Comparing the Public Investment and Economic Benefits we can see clearly in three counties that the return on public investment is almost immediate. In Beltrami, Crow Wing and Goodhue Counties the annual collective economic benefit for households is more than the public sector broadband network investment – by a considerable amount. This is true, in part, because the local provider invested their own funds for the broadband network, so less public funding was involved. These counties also have considerably higher population than the other two so the value (when calculated by households) is inherently higher. In Sibley County, the annual economic benefit is just under the investment, so it will take just over one year for citizens to see a return on investment. Lake County is in a different position; there are fewer homes and the terrain is difficult. Yet even in this case, Lake County should see the economic benefit surpass public investment in just over six years. What factors influence those impacts? Even in this small sampling we can see that some of the factors that are most important to making broadband work – population size (or population density) and an engaged provider – are out of the control of the community. But Lake and Sibley counties have proven that it is possible to make it happen without those things. In both cases, there were two factors that made broadband possible – tenacious leaders and public/community investment. In Sibley County, their community vision helped to attract a committed provider partner that has been a key asset to the project’s success. For Lake County, the opportunity to apply for federal funding through the American Recovery and Reinvestment act (ARRA) stimulated interest and action. County Commissions had the courage to move forward despite the risk. As detailed in the report, their path has been bumpy, but the Commissioners stand by their decision. Their vision, leadership and tenacity have been key to getting the network built. The community benefits will come. This is true in most hard-to-serve rural places: local leadership matters. Most communities will look to outside parties for expertise on the technical choices involved, but local community champions are needed to drive the vision and follow through. Sibley County has a slightly different story, although like Lake County they have been at this for a long time. This report details the story of how initially the counties and towns were going to work together to find a way to build broadband for the whole community. When that fell through the citizens, stepped up to create a cooperative. Many tireless leaders stepped forward to drive this approach and build the momentum needed to move forward with public funding through $13.7 million Generally Obligated Tax Abatement Bond (between Sibley and Renville Counties). What is the role of local leaders? Community leadership is essential to maximize broadband use. Improvement requires a concerted effort, throughout a community with a fortitude to weather the time it takes. The table below highlights leading community partners and the origin of the movement. Red Wing is the new kid on the block with a start date of 2013, but Red Wing has been working on broadband access and use dating back to at least 2009. Beltrami County Bemidji Leads: BLAEDC, Chamber Been meeting for 15 years to plan from the future. Broadband was key. They still meet regularly. Crow Wing County Brainerd Lakes Chamber of Commerce, BLAEDC, Schools Held a conference of leaders in 1999. In 2001, the school took the lead to getting broadband. Joined BBC. Goodhue County Red Wing Ignite Founded in 2013 through local foundations and the city to support better broadband use. Joined BBC. Lake County County Commissioners / Lake Connections Stimulated with ARRA funds in 2010. Founded to bring better broadband. Joined BBC to spur adoption. Sibley County RS Fiber Started in 2015, after 10 years of striving for broadband. Joined BBC to spur adoption. All of the featured counties have received funding from the Blandin Foundation. Through that affiliation they are familiar with the Blandin’s a rural adaption of the Intelligent Community Forum model – the Minnesota Intelligent Rural Communities (MIRC) model, a holistic, broadband-based economic development strategy that embraces five community indicators of success: broadband, marketing and advocacy, knowledge workers, innovation and digital inclusion. 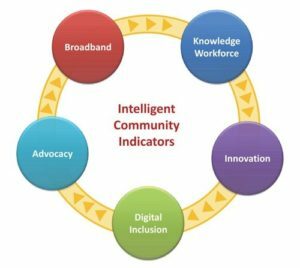 Each community determined their own priorities and projects based on the indicators but it has been an approach that has encouraged the counties to work on a holistic plan that makes broadband a means to an end, not the end. What is the role of providers? An engaged provider is best case scenario for a community in need of better broadband. In three of the case study communities the provider took the lead on broadband connectivity and participated in community efforts to increase use and sophistication of use. In Beltrami County, beyond bringing “Gigazone” fiber network to the region, Paul Bunyan Communications’ contributions as a community partner include its participation in the LaunchPad, the local co-working space and hosting an annual online Gaming Championship. Paul Bunyan’s CEO is chair of Greater Bemidji, the local economic development organization. In Crow Wing County, Consolidated Telephone Company (CTC) has invested in equipping a meeting room in the local economic development office that can be used for training and other meetings; has provided grants and technical assistance to area schools; and their COO is on the board of the Brainerd Lakes Development Corporation. In Goodhue County, HBC was active in getting Red Wing Ignite started and with continued operating and project funding. Lake and Sibley counties started their own broadband organizations when they failed to find a wiling provider partner, one a government enterprise and one a broadband cooperative. These investments in their own future required significant capital and human commitment. And they were risky and controversial among folks who doubted that the communities would benefit in the long run. Perhaps in part because the economic future of both community and provider are so closely tied, both of these new provider entities has taken an active role in supporting community broadband adoption efforts. Community leadership is essential to maximize the economic benefits of broadband use. Four of these communities set improved broadband services as a priority, with two (Lake and Sibley) making extraordinary local efforts to make it happen. Beltrami has been lucky to be able to partner with a locally-owned community-minded cooperative provider that has been a national leader in bringing world-class gigabyte speed symmetrical fiber networks to hard-to-serve rural areas. Each of these communities has created “civic infrastructure” to support this long term work; leaders meeting regularly at multiple levels to maximize the economic benefits of broadband investments. Examples include economic development boards of all types, chambers of commerce and their committees, Blandin Broadband Community steering committees, and county commissioners and city councils. Beltrami’s cross-sector leadership team has met monthly for more than 15 years.